Snap a photo of your dog to send in Christmas cards. Christmas cards with dogs are the perfect holiday card choice for the pet owner or animal lover during the festive season. The best way for any pet owner to show off his/her love of dogs is to have a photo Christmas card made with a picture of Fido. Taking a great photo with your pooch or of your dog by himself involves some patience and creativity. If you want to take a Christmas card family photo with your dog, consider going to a photographer's studio. Unlike mall or many chain studios, they can often accommodate four-legged friends and provide outdoor photo options. You could also try to take your own family photograph using a self-timer on your digital camera, but be ready to do many retakes, as someone often turns their head, sneezes, or your doggie will take off just as the shutter snaps! Doing a separate photo of your dog may be the better option. Head outside for some fun in the snow and get an action shot of Fido running, jumping, and playing in the snow. If you live in an area where the weather is not cooperative, consider putting your dog in reindeer antlers or a Santa hat made especially for him. Tell your dog to "stay" and snap a few photos in front of the fireplace or tree. Have squeaky toys to hold your dog's attention. Unless your dog loves your cat the whole year 'round, do not expect a holiday photo of the two of them together to turn out. Make sure your dog has been exercised before the photo session; he is more likely to lay or sit still. Use the "pets and kids" setting on your digital camera, if available. Do not force your dog to sit or lay in uncomfortable positions. If your dog is not enjoying himself, put the camera away and try again later. Once you have your photo, upload your photo to a digital website, like Kodak, Winkflash, or Shutterfly and create holiday cards. You can also buy cards in discount stores where you can slip a 4x6 photo into the front. If you cannot get Fido to cooperate for your holiday Christmas card photo, do not fret. You can still show off your furry friend by picking out a dog breed card. Both illustrated and photo cards are available in a variety of breeds. Santa, Frosty the Snowman, or holiday scenes may be included in the card's design. Inky Paw: Over 75 dog breed cards are featured, including hard-to-find breeds like Brussels Griffon, Great Pyrenees, and Soft Coated Wheaton Terrier. YUCKLES! : Get illustrated and photo cards in a variety of breeds from YUCKLES! Telia Fleming Hanks - You'll find beautiful, illustrated cards for all breeds. Sweeney Holiday Dog Art - Margret Sweeney's adorable dog paintings are reproduced as gorgeous Christmas cards in a number of breeds. Browse for other dog cards that are multi-breeds or that have an indistinct breed illustrated on the front. 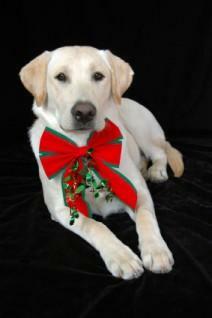 Find a selection of Christmas cards with dogs at Amazon.com. American Humane Association: Get puppy cards, cards with a variety of animals, dogs with Santa, and more. Guide Dog Foundation for the Blind - You'll find doggie cards, gift tags and note cards. Whether you do a family photo with your furry "child," take one of Fido by himself, or just order a cute dog holiday card, your friends and family will surely smile at the sight of dogs and puppies as they open their Christmas greeting card.